Ask folks what a cobia looks like and you’re likely to get one of two responses: Shark? Catfish? Then ask folks what cobia tastes like. It’s likely to be described as a cross between swordfish and Chilean seabass, or sturgeon and hamachi. One thing we know for sure? Cobia is a delicious fish that lends itself to a wide variety of culinary applications, both raw and cooked. Recently we added sashimi grade Open Blue Cobia to our portfolio of high-quality, responsibly farmed seafood. Wild cobia is a species native to mid-Atlantic and Indo-Pacific waters. The tasty fish are fast-growing and get quite large, making them a favorite catch among sport fishermen. What makes them difficult to catch on a commercial level is the fact that they don’t school. This is where aquaculture comes in. Open Blue Cobia are raised six miles offshore on the Caribbean Ocean in Panama by Open Blue, the largest open ocean farm in the world. Open Blue operates at the forefront of the seafood industry with a state-of-the-art deep ocean mariculture platform supported by advanced hatchery and processing facilities. Here, fish receive a continuous flow of oxygen. The nets used never touch the ocean floor. No cumulative impurities are in the water column or in the bottom, and there is minimal to neutral impact on the ocean environment. Fish are free of contaminants, pesticides and hormones. Importantly, Open Blue Cobia are fully traceable from egg to plate. We love the taste and texture of this fish and think it’s a definite must-try for those who are unfamiliar. To learn more about Open Blue Cobia, check out this article in National Geographic or visit OpenBlue.com. Presented by Chef’s Roll and sponsored by Avocados from Mexico, “Avocado Madness” is the third installment of Chef’s Plate. In the style of March Madness, the culinary battle started on March 1st with a line-up of 64 chefs who developed avocado-inspired recipes through a possible six rounds of competition. Each week half made it through to the next round until there were only four remaining. From those finalists, two were selected to travel to San Diego for a live competition where they created an avocado-inspired menu in front of the city’s best chefs and culinary press for a chance to win some amazing prizes. The final match took place April 6th between Chef Dorian Southall and San Diego’s own Chef Ricardo Heredia at Kitchen 4140. The celebrity-studded judges panel included our fishmonger Tommy Gomes; Troy Johnson, food writer, and host, writer and judge for Food Network; Katherine Humphus of Kats Kitchen Collective, and renowned Cali-Baja chef, Javier Plascencia of Bracero Cocina and other notable restaurants in Mexico and Southern California. At stake was $10,000 cash, a professional knife set from Gunter Wilhelm Cutlery, as well as a golden ticket to the World Food Championships for the chance to win $100,000. The head-to-head avocado-inspired menu included an appetizer course featuring our Baja Seas Hiramasa, a sustainable farm-raised sushi-grade yellowtail from Baja California. In a very tight race, Ricardo Heredia was crowned both “People’s Choice” and overall champion of Avocado Madness and Chef’s Plate 3. Congrats to both chefs on a most delicious event! Captain Andy Saraspe fishes from San Diego on the F/V Sarah Renee. Andy’s boat is run by a three-man crew: himself, Steven Ford and Bill Gaedke. They land local spot prawns as well as spiny lobster, rock crab, small U.S. octopus (1-2lb each), and albacore. Captain Andy’s father was a fisherman so it’s no surprise that Andy followed in his footsteps. He has been fishing for 34 years. In 2003 Andy also started Five Star Fish Processing with his wife Sarah. The Point Loma-based company services San Diego area sportfishing boats, taking in their fresh catch to fillet, smoke or jerky. The local spot prawn season runs from February to November, with the majority of the harvest coming in midsummer. However, even during the best of times, the catch can be erratic due to poor weather conditions at sea. As a result, these highly coveted shrimp sell out as fast as we can get them in our tanks! The delicate spot prawns are caught in traps at depths up to 1,500 feet and kept alive on board the F/V Sarah Renee. Their deep cold water habitat requires careful handling in order to keep them alive during the trip back to shore. Once at our location, they are maintained in cold water tanks until they are live shipped. 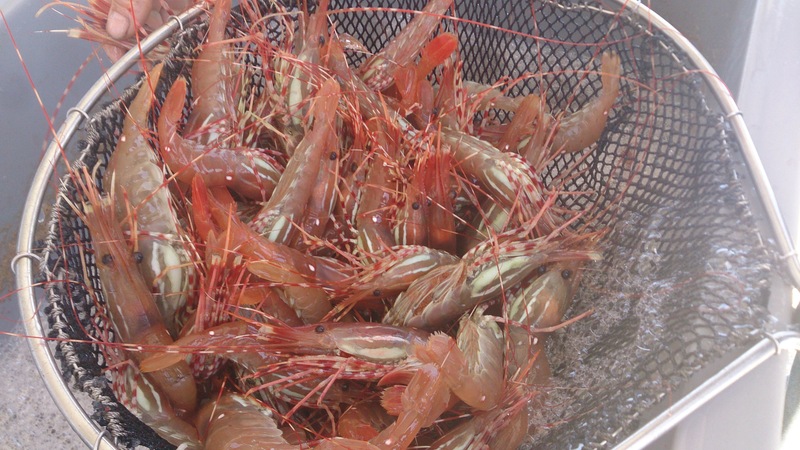 Live spot prawns are the freshest, best quality you can get. Amaebi or sweet shrimp in Japanese, our California spot prawns are known for their succulent, sweet flavor and silky finish. In many ways, these are closer to lobster than other varieties of shrimp. Spot prawns are often served with their heads on, where the juices add significant flavor. They are typically enjoyed raw in sushi bars or lightly steamed and are equally in cooked applications including Paella and seafood soups and stews.